In January, Nadeem Muhammed tried to carry a bomb onto a Ryanair plane at Manchester Airport. A Ryanair flight at Manchester Airport. 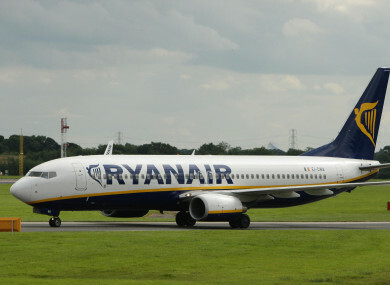 A MAN HAS been found guilty of trying to board a Ryanair flight to Italy with a viable pipe bomb in his hand luggage. On 30 January, Nadeem Muhammed from Bury in Greater Manchester tried to carry a bomb onto a plane at Manchester Airport when security officers found it concealed in his case. The bomb, built inside a sealed marker pen barrel, was designed to be activated manually. It could not have been detonated remotely or automatically. The prosecution argued that the only reason the 43-year-old took the device through airport security was to detonate it in the confined space of the plane, endangering the lives of passengers while causing serious damage to the aircraft. When initially questioned, he claimed that one of his five children may have put the pipe bomb in his luggage. His movements at the airport were captured by CCTV footage seen below. During the trial he asserted that he was not aware of the device and that it must have been placed in his bag by an unknown third-party. Despite extensive investigation, Nadeem Muhammed’s motive for attempting to take this device onto a plane remains unknown. However it is clear that the consequences, had he been successful, could have been disastrous. The CPS put a strong case to the jury resulting in him being found guilty today. He will now be held accountable for his actions. Muhammed will be sentenced on 23 August 2017 at Manchester Crown Court. Email “Man found guilty of trying to smuggle pipe bomb onto Ryanair flight ”. Feedback on “Man found guilty of trying to smuggle pipe bomb onto Ryanair flight ”.